AbanteCart is an eCommerce platform developed and supported by a group of talented and experienced people. The first place in this category is held by Wix which has a total score of 9.8/10 and is the winner of our Best Shopping Cart Software Award for Q1 of 2018. You can try out Wix for free here. 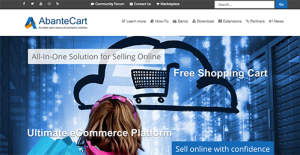 Developers of AbanteCart wanted to provide an excellent eCommerce alternative for individuals and businesses. Created with no quick routes and shortcuts AbanteCart is totally free and receives its funding for further development from donations, contributions, marketplace proceeds and advertisers financial support. Developed specifically for small and medium-sized businesses, Abante Cart comes with a long list of advantages that make it an appealing eCommerce solution. It is a FREE platform that comes with free support from a community of experts. It is simple to setup and easy to use. Highly versatile eCommerce application that can be expanded with extensions to grow with your business. Safe and fast, AbanteCart is constantly monitored to ensure that issues are quickly spotted and addressed. There is no limit on your inventory, traffic, number of customers, etc. If you are interested in AbanteCart it could also be sensible to check out other subcategories of Best Shopping Cart Software collected in our base of B2B software reviews. It's essential to note that virtually no app in the Shopping Cart Software category is a perfect solution able to meet all the goals of different business types, sizes and industries. It may be a good idea to read a few AbanteCart reviews first as specific solutions may excel only in a very narrow group of applications or be prepared with a really specific industry in mind. Others may work with an idea of being simple and intuitive and therefore lack advanced features welcomed by more experienced users. You can also come across software that support a broad group of users and provide a complex feature set, but that frequently comes at a more significant price of such a service. Be certain that you're aware of your needs so that you choose a service that provides exactly the elements you look for. How Much Does AbanteCart Cost? We realize that when you make a decision to buy Shopping Cart Software it’s important not only to see how experts evaluate it in their reviews, but also to find out if the real people and companies that buy it are actually satisfied with the product. That’s why we’ve created our behavior-based Customer Satisfaction Algorithm™ that gathers customer reviews, comments and AbanteCart reviews across a wide range of social media sites. The data is then presented in an easy to digest form showing how many people had positive and negative experience with AbanteCart. With that information at hand you should be equipped to make an informed buying decision that you won’t regret. What are AbanteCart pricing details? What integrations are available for AbanteCart? Cons: Abantecart has a rather small array of addons, and a pretty small community that is primarily centered arround making money and not helping with coding for free. but it seems like the developers are quiet active in the forums. you are unable to communicate with the customers via the webinterface. and relying on e-mails from the customers. you can add notes to orders. but the customer is not able to reply unfortunately. the newsletter is as i see it built to handle many customers. but lack html features, so no imges or other formatting of newsletters. there are not many human made translations. but there is a library of machine translated languages and a very neat feature for translating every bit of text via the administration interface., allthough with some text it can be a little hard to guess where it belongs. but its only a matter of checking and trying again. Pros: The best aspect of Aabtnecart is a no to the low cost of a start. The platform comes with powerful tools to get you started. Marketplace offers inexpensive plugins from different developers. Compare to other shopping carts we researched, Aabtnecart runs the fastest. Cons: I think more plugins and themes in the marketplace would help. If you need more information about AbanteCart or you simply have a question let us know what you need and we’ll forward your request directly to the vendor.